Thank you. Truly. You all are so nice, and left such sweet comments about my grandfather. I really appreciate it. I haven’t really been doing much sewing this week, though I do have photos of the Anna Maria Horner voile string top that I sewed together last week. I made 10″ string blocks (tutorial here), but instead of keeping the strings completely straight, I went for a wonky look. It’s not super wonky — just enough to give it a little extra something something. Still working on a backing, but hopefully I’ll get something figured out soon because I’m looking forward to seeing this one finished! This entry was posted in Posts about Quilts and tagged anna maria horner, colorful, handmade, little folks, quilt, string quilt, wonky. Bookmark the permalink. I’m completely in love with your colors here!!! Love it!!! So bright and cheerful… it’s perfect to break up the winter! Order and wonkiness with lots of color are part of my inheritance from my dear grandfather and from my father who was a grandfather,too. I suspect your artistic expression (as in this latest beauty) will always reflect your grandfather’s influence in your life. Wow the wonkiness gives it a whole different look. It looks AWESOME! I have done some quick pillow work with her other line and always wondered how it would all look together on the quilt top. I love it! Not at all too busy like I feared. I might have to add this to the to do list. The quilt is gorgeous. I’m always fascinated by your photographic backdrops. SOOOO interesting. And they just add to the total artistic quality of the quilt. the slightly wonky strings look beautiful… great design decision. It’s perfectly wonderful – one of my favorites to come out of your workshop for sure! I especially love the green strips in the middle… perfect. 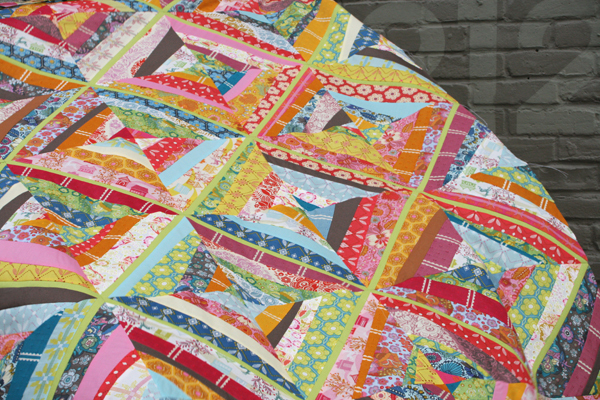 The quilt looks amazing – I’ve been too chicken to cut into mine yet! That quilt looks so yummy. Love the explosion of colors! And I do love that narrow green sashing in between all the wonkiness. Very cool! This is really beautiful… hope it lifts your spirits. Love “Froth” one of the solids for the back or binding – the pale yellow is lovely. just beautiful – inspired to try out this type of quilting! Ashley, I am so sorry to hear about your grandfather. My thoughts and prayers are with you and your family. On a brighter note, I love your quilt!! Just beautiful! I haven’t been much of a string quilt fan…UNTIL NOW! That is just gorgeous. GORGEOUS. I love the green sashing and I particularly like the slices of the deep solid brown – they really anchor each block and allow the eye to rest on individual fabrics. This will be a beautiful quilt! While on the subject of string quilts, I made my first one using your fabulous tutorial! I linked to it in my blog post as well. Thanks so much. 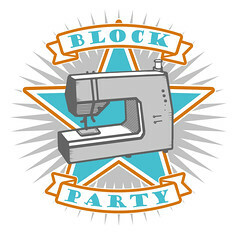 i love your blog and your quilts!! Love the idea of a little wonky with the blocks. It’s looking really pretty! Lovely! 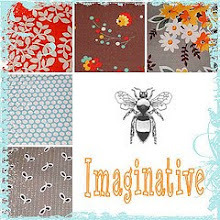 Thanks for the inspiration…I think I am going to use this fabric for my next quilt! The wonkiness makes it. Beautiful. It’s sooo cute!!! I LOVE all the color, very bright and vibrant. It turned out great…mabey for the back you should try something simple like a solid color with a strip of the fabric from the front. 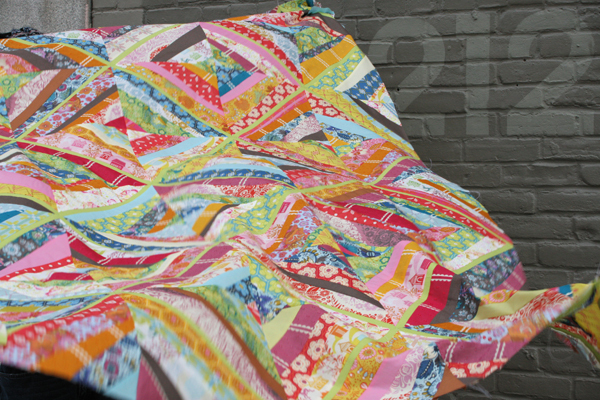 Your quilts are beautiful!I love your style and color choices! I am also addicted to string quilts! 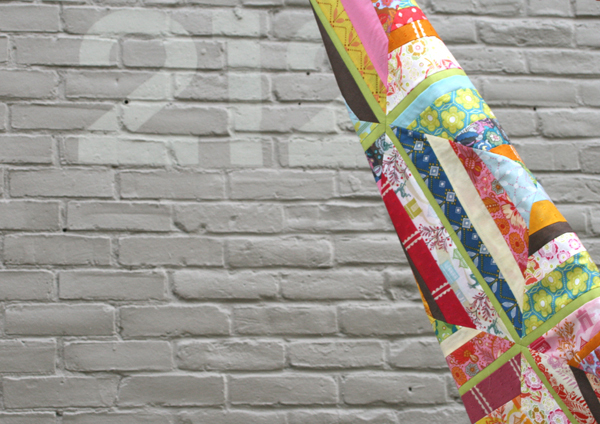 I’m writing a Squidoo lens about all sorts of quilt styles. I have linked to this page, but I’d like to use a picture from the quilt (linked also back to here) if you would allow me.